The above two images are generic cut-outs. 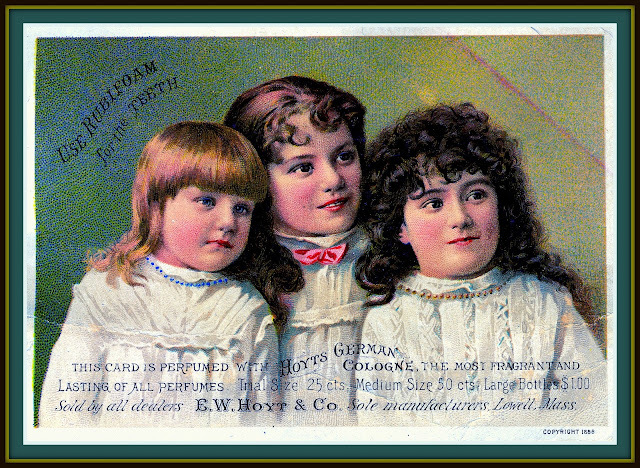 The above victorian die cuts were processed in Picasa to yield very different results. These variations are fairly easy to apply once you become familiar with Picasa or a similar photo processing program. In 2016, there are several useful photo processing programs available. The variations above are provided here as a demonstration. Try this for yourself! The Arnold scrapbook contents are in the public domain. You may clip, save and manipulate images as you please for whatever purpose you have in mind. Please credit the Collection as the source of the original image. of its trade card designs, containers and means of distribution. Thanks, Cliff & Linda & Simon Hoyt! The Center for Lowell History notes that "On Andover Street in Lowell, Massachusetts, two grand homes, each a mirror image of the other, stand as visible testimony to the love and affection between two life-long friends - Eli Hoyt and Freeman Shedd." It was due to the talents of these two men that Hoyt's German Cologne became a successful business enterprise. It is likely Freeman Shedd designed the trade card above. 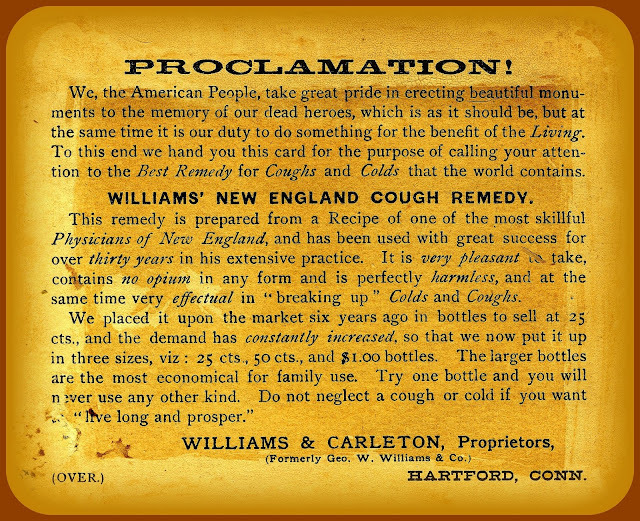 This turned out to be one of the first and best trade card promotions ever. The cards, of various designs, were saturated with the product. Who could resist?! Click here to read the entire booklet. 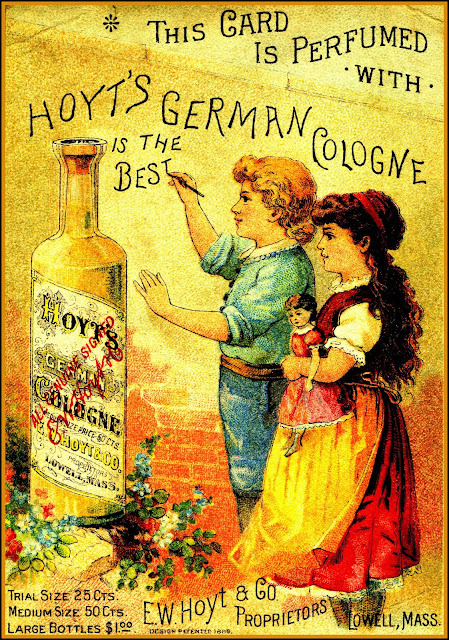 "Eli W. Hoyt was born in Alexandria, New York, September 5, 1838 and began working for E. A. Staniels when he was fourteen. 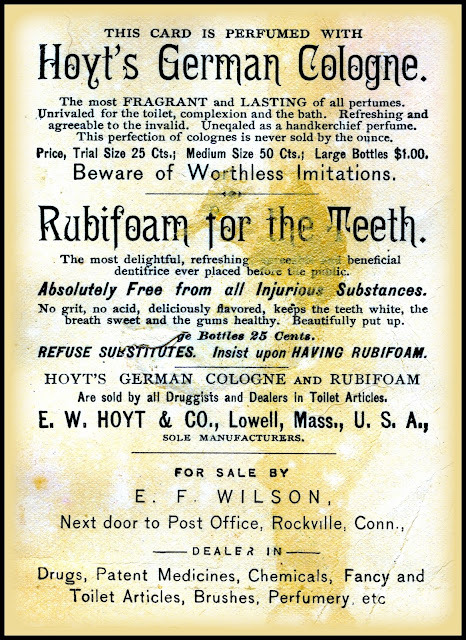 He was later taken on as a partner and, upon the death of Staniels in 1861, became sole proprietor of the drugstore. Nine years later he formed a partnership with Freeman Shedd. "The up-and-coming firm of E. W. Hoyt, purveyors of Hoyt's famous German cologne, was one of the first firms to use advertising cards. Freeman Shedd designed the labels and wrote the copy. 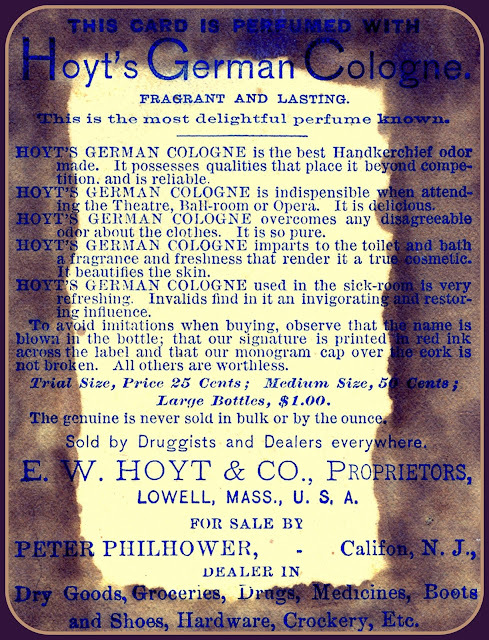 The distribution of the 'cologne card' [infused with the product] was a clever advertising strategy and soon their product had spread beyond the city of Lowell and the state of Massachusetts...."
"...In 1875 Freeman Shedd and Eli Hoyt moved to their "twin mansions of cologne" on Andover Street. These prosperous local businessmen were only thirty-one and thirty-seven years old, respectively... The design was Mr. Shedd's - two magnificent homes, each the mirror image of the other. They shared a front veranda, inner garden, and summer house, all bearing testimony to a close and enduring friendship." William Raveis, R.E & Home Services, Andover MA also posted an interactive floor plan for the Hoyt mansion. for small images of the interior spaces. Google Street View cameras survey urban locations especially frequently, sometimes almost every year. This allows one to follow historical transformations. In the case of the Shedd mansion, there is a nice sequence of views showing recent renovations. Thanks to Google for improving the resolution of their cameras over the years these Street Views were taken! Click the white dots on the time line for various years. "About 1884, two barns were built on East Merrimack Street, one for each home, with driveways bordering the outer sides of the residences. These massive structures were built by James W. Bennett, and had minaret-like towers. They were of solid brick and heavy timber construction, and living quarters were provided in each barn for a coachman and his family." These "barns" are unlike anything I would describe as a barn! The shading on both sides of this card is the result of the enthusiastic application of way too much glue. 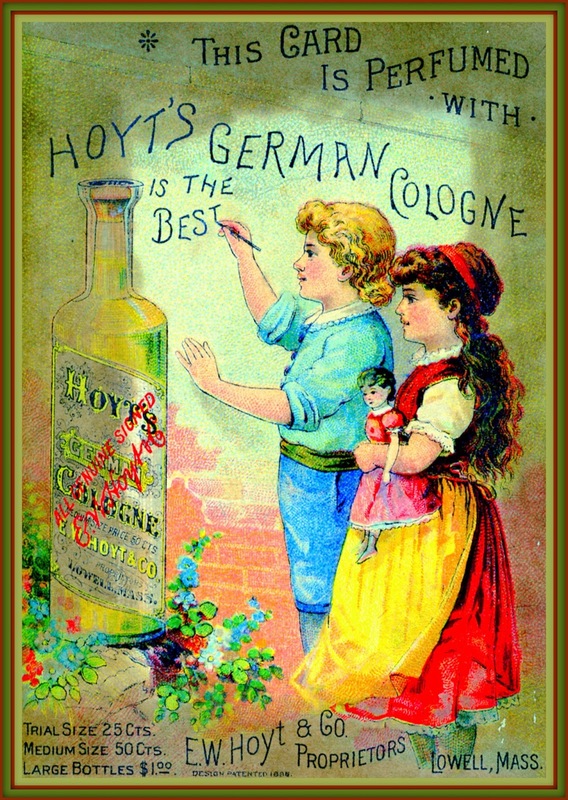 Since 1886, the perfume evaporated, but the color remained strong! Soup making in the Hoyt or Shedd kitchens was probably done from scratch, using fresh garden ingredients when possible. 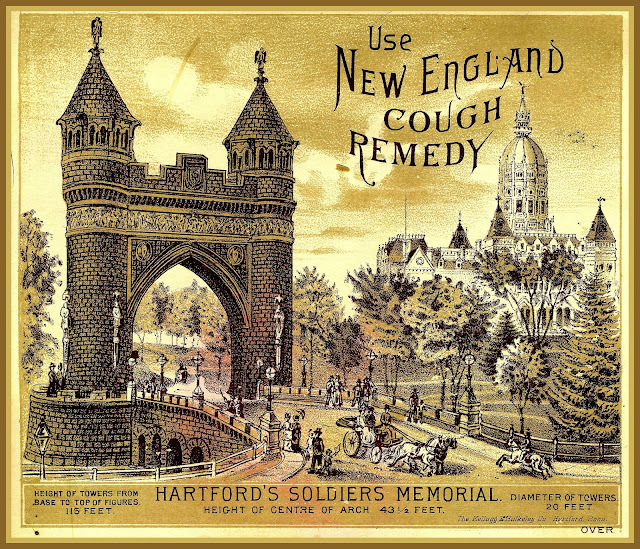 The stock, however, could well have been made using Armour's Extract as part of the recipe. Michigan State University's "Little Cookbooks" Collection is highly recommended as a source of Victorian recipes. "Gracie" is most likely Earl J. Arnold's sister, Grace (Arnold) Brightman. and very fond memories, no doubt.